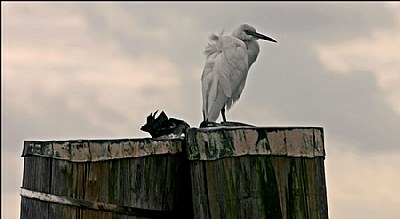 About An egret found on the beach as I was leaving the Florida coastline. As you can see by his ruffled hair it was getting windy. P.S. Thank you for thoughtful look at my latest...appreciate the feedback. Very nice capture Kelly, he looks a little cold. Nicely cropped and composed. Fabulosa captura... felicitaciones Kelly, me gusta esta imagen! Very nicely composed, and great colour and detail, Kelly! I can feel that wind in my hair(what's left of it! )looking at this shot. Looks like he's the king of the piers, standing up there all by himself. I like the composition of this, the strong piers where they are at makes the photo very bold... the wind and the sky makes it look very cold!